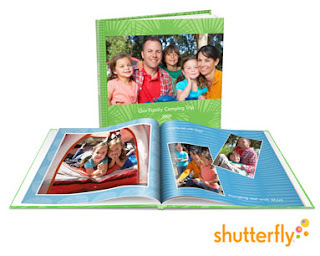 A friend of mine gave me a Shutterfly promo code for a free photo book. I was so excited! With only 3 days left before the offer expired, I decided to get right to work and start creating a book featuring photos from a milestone birthday that I had been meaning to create for months. I couldn't wait to finish it and see that all I would have to pay would be the shipping and handling. Boy was I wrong! Most people love snapping digital photos. They save them on their computer, send a few here and there, maybe upload a couple to their facebook account but rarely print any at all. So, now you’ve received a coupon code from a friend to try http://www.shutterfly.com/ which is similar to snapfish and kodak gallery. These online sites let you upload and store your photos and then later enlarge them, print them out or use them to create fun memory items like mugs, invitations, Christmas cards or a personal favorite, a photo book! Most online retailers will accept the promo codes that circulate on the web. Some are different though, like Shutterfly. They use specific targeted marketing in the form of emails that get sent out to their current account holders. The promo codes sent to each person are specifically tailored to them and have long promo code numbers which correlate with their exact account. So, if you try one that your friend has given you, chances are that it will not work. I’ll keep my book sitting in my account and perhaps one day when the offer is good enough, I’ll print it. But as it stands, without knowing what the print quality is like from Shutterfly, I want to wait until the investment is minimal and then I might consider ordering future books if the first one turns out well. The good news is you can find many promo codes for other photo printing vendors online. So, happy coupon code hunting but always remember to test out the checkout center before doing all of the work first! Trying new recipes is one of my favorite things to do, especially if it is a dessert! 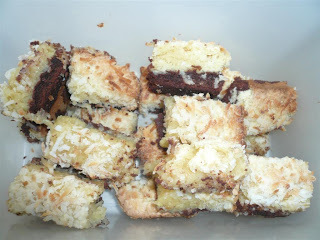 My husband is a coconut lover and I decided to make him a treat that he couldn't resist-Black-bottom Coconut bars. These are a combination of 50% brownie bottom and 50% coconut macaroon top, they are 100% DELICIOUS! These bars are great for entertaining no matter what the occasion is. Here is the recipe so you can try them too! It is compliments of Martha Stewart. · 1 package sweetened shredded coconut (7 ounces), 1/2 cup reserved for sprinkling on top. 1. For chocolate base: Preheat oven to 375 degrees. Line a 9-inch square baking pan with aluminum foil, leaving a slight overhang; butter bottom and sides of foil (not overhang). 2. Place butter in a large microwave-safe bowl; melt in microwave. Add sugar and salt; whisk to combine. Whisk in egg, then cocoa and flour until smooth. Spread batter in prepared pan. 3. Bake just until sides begin to pull away from edges of pan, 10 to 15 minutes (do not overbake). Let cool slightly while preparing coconut topping. Keep oven on for topping. 4. For coconut topping: In a medium bowl, whisk eggs with sugar and vanilla. Gently mix in flour and coconut (except 1/2 cup reserved for sprinkling). 5. Drop mounds of mixture over chocolate base; spread and pat in gently and evenly with moistened fingers. Sprinkle with reserved 1/2 cup coconut. 6. Bake until golden and a toothpick inserted in center comes out with moist crumbs attached, 25 to 30 minutes. Cool completely in pan. Lift cake from pan, peel off foil, and cut into 24 bars. Store in an airtight container 3 to 4 days. As we all know, drinking more water is essential to good health. But for some it's hard to think about drinking 8-12 glasses per day. Here are some easy ways to incorporate more water drinking into your day. 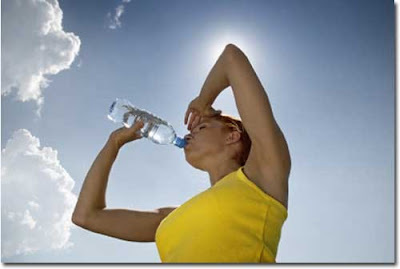 Most people avoid drinking water because the quality of the water tastes bad or because water doesn't have any flavor. Firstly, ensure that you are drinking filtered water so the taste isn't an issue. That is as simple as using a Brita filter or in-home filtration system. Try to avoid costly bottled water which use a lot of resources to create the plastic your water is contained in. You can add a little flavor to your water by adding a squeeze of lemon, orange, or a slice of cucumber. You could even add a dash of 100% natural fruit juice like pineapple or grape to perk it up! You will drink more water if you have a way to keep track or count the amount of cups you are drinking. Using a reusable nalgene bottle or a brita pitcher with the number of cups indicated will give you a sense of accomplishment as you go about your day. It's hard to lose count when the container does all the work for you. Simple fill it to 2L and keep drinking until it's all gone! There are SO many health benefits to filling up on H2O including clearer skin, fresher breath, hydrated, more youthful skin, no dehydration headaches and the cushioning of your joints. While pure water is important for our body's functioning, other liquids that include a lot of water will help add to your daily quota. Soup (thin, not heavy chunky kinds) can be an excellent way to add more water, especially at lunch time, provided it is mainly consisting of broth. This is a great way to fill up too, helping you eat less and lose weigh along the way! Smoothies are another great way to add water. Instead of using milk, soymilk or juice for your smoothies, add your fruit but use water instead. For a healthy snack idea, check out this post. What tricks do you use to consume more water daily? Leave a comment and share with us so we can use you tips!